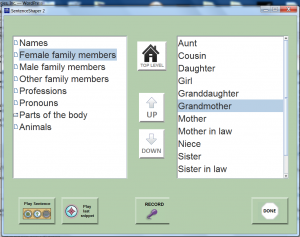 Edit the WordFinder : For extensive word-finding support - Psycholinguistic Technologies, Inc. 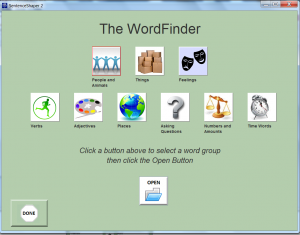 The most extensive word-finding help in the program is provided by the WordFinder. It is an organized list of printed words. Clicking one of these words causes its sound file to be played, and you record the word in your own voice to include it in a sentence. The program comes with a WordFinder that contains approximately 1,000 words. However, you can make your own versions of it with the WordFinder editing tool. You access the WordFinder by clicking a button on the program’s main screen. Shown below is the WordFinder’s opening screen. Note: To enlarge the screen shot below, click on it. Then use your browser’s back arrow to return to this page. The icons on this opening screen represent very general groups of words. We call them the ‘”top level word groups”. Click any button to hear its name and to select that category. When you have found the category you want, click “Open”. If you open the “People and Animals” word group, for example, you will see a screen like the one below. Note: To enlarge the screen shot below, click on it. Then use your browser’s back arrow to return to this page. 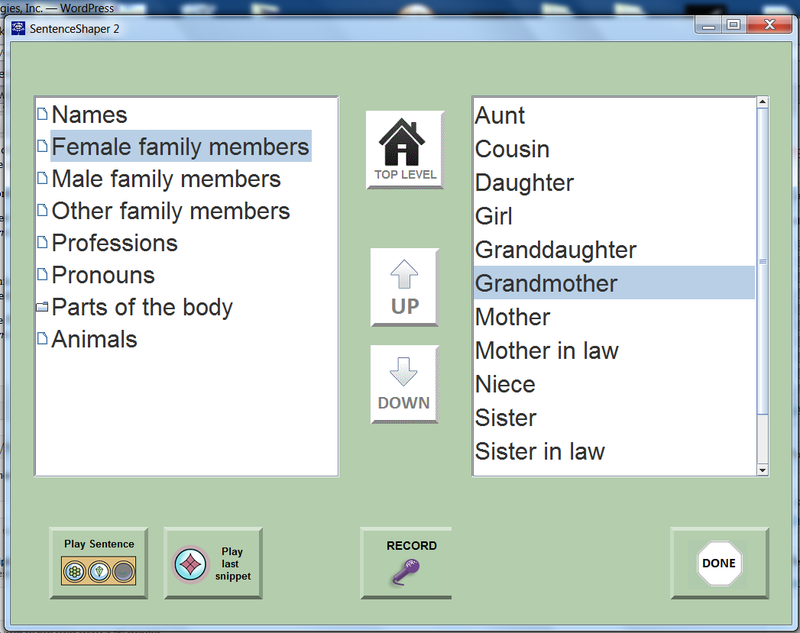 If you click the word “Grandmother”, for example, it plays the word aloud. You then record it in your own voice to use it in your production, and click “Exit” to return to the main screen. The WordFinder Editor allows you create customized versions of the WordFinder. For example, some users may require a very small WordFinder, or you may have a therapy workbook in which users are retelling short narratives. You can create a mini-WordFinder for each story in the workbook. The built-in workbook called “Stories with WHY Questions” does just that…each story has its own WordFinder. You can change just about every aspect of the WordFinder in its editing tool: You can add or delete word groups and words. For the top-level word groups, you can upload icons to display on the WordFinder’s opening screen. This is probably the most complex tool in the program, and you don’t really need to use it. But if you want to create customized vocabulary support, you will have a lot of options!